Named after the owners’ beloved rabbit, PJ. This suite resides on the second floor of the Artist’s Annex that was built on the grounds of the old City Brewery. The suite has been recently renovated and features artwork by the artist owner Charles, as well as a handcrafted four poster queen size bed. Enriched with regional antiques. 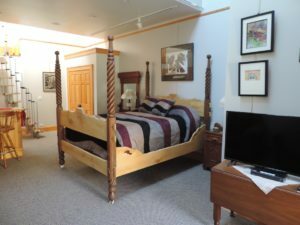 This suite is perfect for a couple’s getaway to scenic, historic Galena. Amenities include a private entrance, queen size bed, private full bath, kitchenette with microwave, coffee maker and small refrigerator, lofted library/sitting area, skylights, Free Wi-Fi, Smart TV, DVD, and on-site parking. Guests have full use of the spa room, containing a six-person sauna, great for those crisp winter evenings or sultry summer nights. PJ's Roost main living area.